Electree Solar-Charging Bonsai Now Available For Pre-Order! We’ve reported on Vivien Muller’s beautifully designed Electree before, but now her spectacular design is finally available for pre-order! The bonsai tree fits on any side table, and also doubles as a solar charger for your devices. The tree, fitted with 27 solar panel “leaves,” will be available for around $400 USD. Muller has spent the last three years perfecting Electree’s eye-catching design. The bonsai tree’s base has been altered from its initial concept of silver, and is now clad in smooth white, resembling a porcelain sculpture. 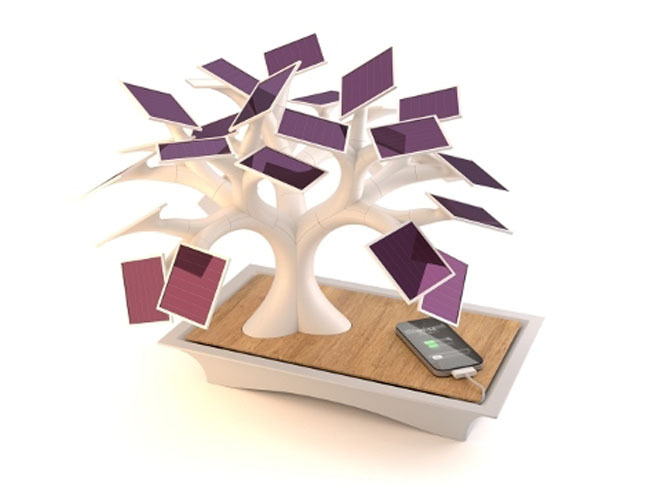 From the branches, the 27 violet high quality amorphous silicon solar panels sprout like leaves. The tree rests on a flat tray, which holds the devices while they charge. The Electree’s branches can be manipulated into different shapes, rotating to fit a shallow window sill or a tight corner. The charging station is not only aesthetically pleasing, but also beautifully illustrates nature’s process of photosynthesis. The solar bonsai, like a real tree, converts the sun’s rays into energy – only this time passed onto you and your devices! Customers can pre-order the unique charging station from Mister Ecologie and One Development & Consulting. If 400 Electrees are pre-ordered before October 15th, production will allow buyers to receive their pieces just in time for the winter holidays! This looks way too much like this http://inhabitat.com/13-year-old-makes-solar-power-breakthrough-by-harnessing-the-fibonacci-sequence/cristian-bortes-tree/?extend=1 designed by a 13 year old kid. We've reported on Vivien Muller’s beautifully designed Electree before, but now her spectacular design is finally available for pre-order! The bonsai tree fits on any side table, and also doubles as a solar charger for your devices. The tree, fitted with 27 solar panel “leaves,” will be available for around $400 USD.